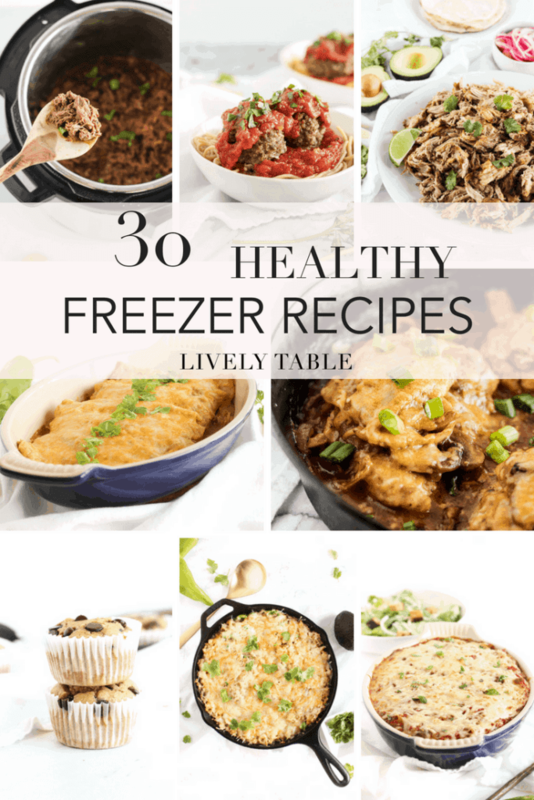 These 30 healthy freezer-friendly meals and snacks are great for prepping ahead and stocking your freezer as you wait for the arrival of a new baby, or just for a busy week ahead! I’m not a huge meal prepper or batch cooker. I truly enjoy cooking healthy meals every night (that’s why I became a food blogger!). But as Mr. Table and I prepare for the arrival of our first baby, I know getting a healthy dinner on the table will be more of a struggle as we figure out parenting and adapt to life with a newborn. To add to the chaos, Mr. Table just got a new job, so he will be out of the house until 5:30 or 6 most days, and I doubt he will want to take on the dinner responsibilities when he gets home. My mom will stay at our house for a little bit, helping us with things like cooking and watching the baby, but I figured I’d better get ready ahead of time for the arrival of our sweet baby girl by stocking the freezer with healthy meals and snacks that I can pull out in the morning to thaw and pop in the oven or crock pot for easy weeknight dinners. When my nesting instinct kicked in, which let’s be real, has been about half of my pregnancy, so more like when reality set in that I better have food ready, I took a weekend to meal prep as much as I could, stocking the freezer with healthy meals, snacks, and sides that will make my life in the coming months easier. Sausage Patties | The Lean Green Bean – Mr. Table likes to heat these up for quick breakfast sandwiches. I froze them in packs of 2. We already have plenty of breakfast sandwich buns in the freezer. 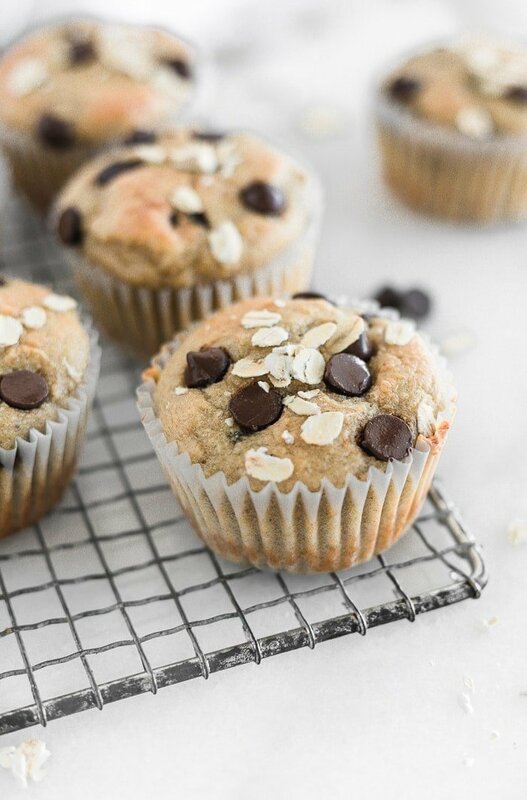 Healthy Banana Nut Bread – My favorite, and Mr. Table likes to eat it for breakfast. Brown Rice – Cooked in broth and frozen in 1-cup portions to take out for a quick side dish. Pinto Beans – Easy to take out for sides or a meal. Enchilada Sauce – It’s so much easier to get dinner on the table when sauces are already made! I did red and green. Spaghetti Sauce – To go with the meatballs I prepped, etc. 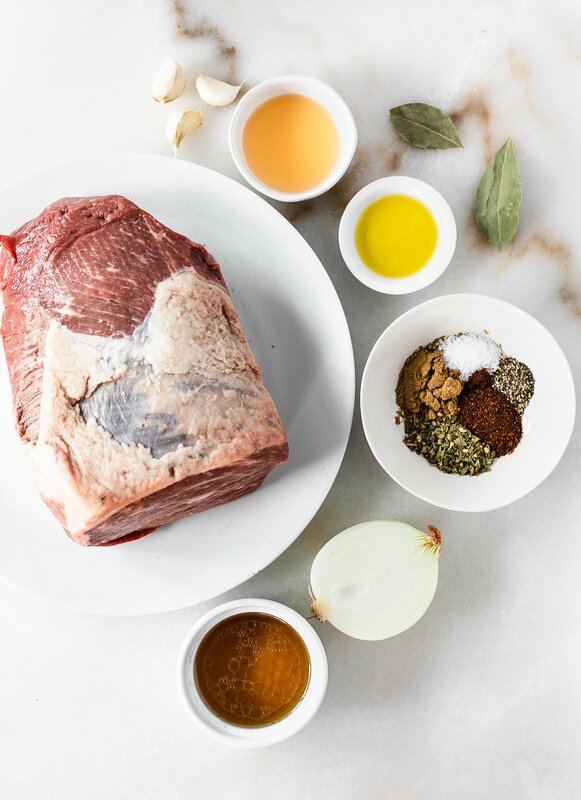 Instant Pot Barbacoa Beef – Portioned into baggies for multiple meals. Pulled Chicken – Also portioned into bags for multiple meals, to make cooking meals one step closer to done. Slow Cooker Carnitas – (I actually made them in the Instant Pot.) I used half for enchiladas and froze the other half into portions for tacos. Green Chile Enchiladas – I assembled them in a foil pan (but didn’t cook them yet) so they are ready to thaw and bake! One Skillet Quinoa Enchilada Casserole – I made one with green sauce and one with red. I also made these in foil pans and did everything except the cooking so they are ready to pop in the oven. Eggplant Italian Sausage Baked Ziti – Same as the enchiladas, I left this unbaked. BBQ Mushroom Chicken for the slow cooker – I just put all of the raw prepped ingredients into a large baggie and froze. I will just have to dump it in the slow cooker on the morning I want to make it. Crockpot Honey Sesame Chicken | Damn Delicious – I did the same with this one as the recipe above. Spanish Style Chicken | Toby Amidor Nutrition – I would place all of the raw prepped ingredients in a bag and freeze to be thawed and cooked in the slow cooker. Did you stock your freezer before baby came? What were your favorites to have on hand?